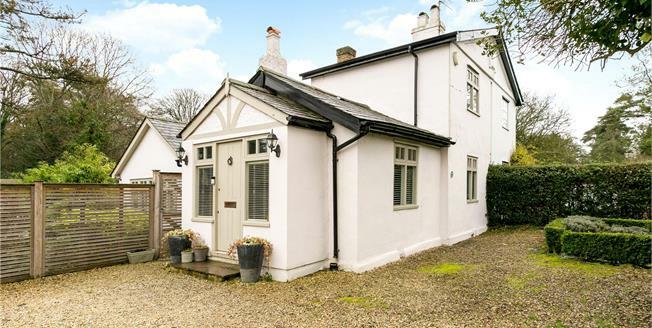 A charming Grade II listed semi-detached cottage that has been sympathetically extended to a particularly high standard, benefiting from a secluded plot of approximately 0.29 of an acre within this sought after hamlet of Heronsgate. This unique property is presented is fantastic order throughout and a viewing is essential in order to appreciate the space and character. The accommodation comprises of: reception hall, fitted kitchen opening to a dining area and living room which boasts superb views over the garden, a master bedroom with en-suite and french doors out to the garden, a further double bedroom and family bathroom are on the ground floor. The third bedroom is located on the first floor. The property is situated in a highly desirable semi- rural setting within the private Heronsgate estate, 1.5 miles from the centre of Chorleywood which has a variety of shops and restaurants with wider shopping facilities available in Watford. Heronsgate was founded by Feargus O'Connor and the Chartist Cooperative Land Company in 1846. In addition to the original 35 plots of land covering 103 acres, a beer house was provided, now the Land of Liberty, Peace, and Plenty public house. It is today a much sought-after village with a social committee which arranges annual carols by candlelight, fireworks and other social events. The heart of the village is much in its original state and the Land of Liberty, Peace, and Plenty stands as it was, along with the church and Chartist hall. It is particularly popular with families for its secluded and safe environment, with easy dog walking and a strong neighborhood feel. The property is highly desirable being in a semi-rural setting of Heronsgate, yet only 1.5 miles from the lively centre of Chorleywood, which has a good selection of local suppliers, such as a butcher, baker, bookshop and newsagents, combined with a variety of cafes and restaurants. The mainline station is within the town centre and usefully serves both the Chiltern mainline and Metropolitan underground. In addition, Rickmansworth and Watford Junction also offer fast commuter connections via network rail and the Metropolitan underground. Nearby schooling is of a high calibre, with the mixed Clement Danes School, Merchant Taylors School for Boys, the Royal Masonic School for Girls and the Watford Grammar Schools. Chorleywood Common is worthy of special mention, encompassing 200 acres of wooded common land. Chorleywood golf course maintains a nine hole course on the common as well as the Chorleywood Cricket club. Moor Park golf course and The Grove, one of South East England’s top Country Clubs and golf courses, are a short drive away. The gardens are a key feature of the house with the plot approaching 1/3 of an acre. The majority of the garden is laid to lawn and bordered by mature hedging. There is a feature pond with various shrubbery. At the front of the property there is parking for approximately 4 vehicles. Local Authority: Three Rivers District Council.